Welcome to the Wanderlust Vegans Kitchen! We will be providing you with simple, easy recipes every Friday for healthy meals on your travels. Today we will be making Tofu Scramble Wraps. Add all the ingredients to a frying pan. Use a wooden spoon to scramble the tofu. Cook the mixture until there is no longer excess water from tofu and the mixture is suitably dry. Scoop the mixture onto a flour tortilla/wrap. Fold the sides of the tortilla and then roll to form a burrito looking wrap. If you want you can add all sorts of veggies to the tofu scramble or field roast sausages for example. What's your favourite tofu recipe? Love Tofu, it is not only tasty but healthy as well. Always prefer it over cottage cheese. Also it is so amenable to cooking and can be used in a variety of ways. The Tofu Scramble wrap looks really enticing, will try out my own variant. It is one of our favourite lunch or dinner ideas. So delicious. I am not a big fan of Tofu since not many people know how to cook it. But this seems like an easy recipe and I will definitely be trying it out. Also as a fellow vegetarian this is something I know would be helpful during my travels. I hope you do try it and love it. Seems like a easy to make one bite... your instructions are helpful. That looks delicious! I have a good friend who would absolutely love this. Do share the love. :) It is amazing. Our favourite dish. It really is. No Cholesterol! Looks so delicious! I can't wait to try your recipe. These look so good! 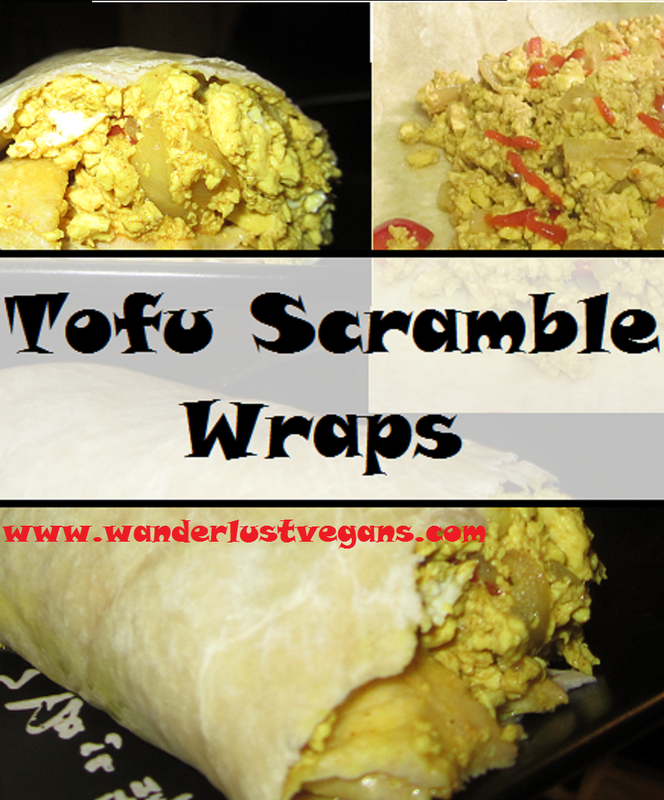 I love a tofu scramble and can't wait to try your wraps! Yum! This looks like a great on the go breakfast. It tastes great the next day too if you store it in my fridge. We make it for dinner too!